Opening Scene: A bottle of wine. A family-sized packet of Nacho Cheese Flavoured Tortilla Chips and a jar of hot salsa dip. A packet of cigarettes on the side (I know, I know). The rain hammering against the windows. And a book. Editor Susan Ryeland has been given the manuscript of bestselling author Alan Conway's latest mystery, and she can't wait to read it. Having worked with the man for years, she's well acquainted with his detective, Atticus Pünd. Conway's main character-- and his books-- are an homage to illustrious writers such as Agatha Christie and Dorothy L. Sayers, and Conway's formula has been immensely successful. But this book is going to be like no other Conway has written, and Susan Ryeland will have to turn into a detective herself in order to straighten everything out. Magpie Murders is a puzzle lover's dream. It contains a mystery within a mystery, and for the most part, I enjoyed every bit of it. The opening scene has Susan Ryeland settling in to read the manuscript of Conway's latest mystery. When she reaches the end, she finds that it's missing the final chapter where all is revealed. But she can't just call Conway and ask for those missing pages-- he's had a bad fall and is dead. Cloverleaf Books' future (and Susan's) depends on the sales of this book, and it is imperative that Ryeland finds that missing chapter. Now Ryeland is a sleuth, looking for and examining clues. What happened to the last chapter of the manuscript? Was the author's death suicide or murder? The first half of Magpie Murders is Conway's manuscript. The thing is chockful of Christie references-- even someone like me who doesn't particularly care for Christie could find several of them unaided. Names, towns, buildings, anagrams... you name it, and it's probably there for you to cogitate upon. The second half is Ryeland's investigation, and I have to admit that I was more successful in deducing what had happened to Alan Conway than I was in figuring out what happened to the characters in his manuscript. Yes, I did enjoy this book a great deal, but I didn't love it, and my reason may not make much sense to you. One of the reasons why I don't care for Agatha Christie is because, whenever I've read one of her books, I am overcome by a feeling of the author's smugness at being able to concoct such a perfect puzzle. I felt this same smugness from Anthony Horowitz... but not to the same degree, probably because the character of Susan Ryeland was the book's saving grace. 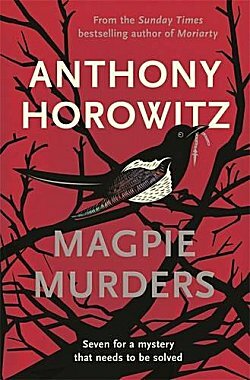 If you love Agatha Christie, puzzles, and enough details and red herrings to sink the world's largest fishing trawler, Magpie Murders is going to be your perfect cup of tea. Enjoy! Source: Purchased from The Book Depository. You know, Cathy, I have yet to read even one negative review of this one. It certainly sounds like a great read, and I appreciate your reminding me that it's out there. I must get to it. I think it's right up your alley, Margot! I have had this book on hold at the library because the release date is today. When I went to Amazon today to see what the U.S. release date is (thought it is probably today due to your review) I noticed there are two covers on this book too.-a U.S. cover and U.K. cover I know this is probably common practice. I liked your comment that you enjoyed the book but didn't love it. There are many books that get the rave reviews that I feel that way about. I've been thinking of doing a cover comparison for this book. We shall see! I have saved your post for when I read the book. Hopefully, it will be soon. I hope so, too-- and I hope you enjoy it! Coincidentally, the New York Times had a review of this book in the June 9 paper in the arts section. It was quite a favorable write-up. But I don't like Agatha Christie's books either. I didn't like the Miss Marple books, but I read some Hercule Poirot mysteries. Then when I was 19, I found racist and anti-Semitic descriptions and language. So that did it for me. I know it was the period of time ... but I read this in 1965 right in the middle of the Civil Rights Movement, and I wasn't going to read it. Interestingly, in the link posted on June 9 to reasons why we should read what we want, there is an article underneath that list by a woman mentioning that she had to stop reading a Miss Marple book because of teh racism in it. What I like is the fact that we can read these books today and know that that language and behavior is wrong. Some people can read these books knowing the language and behavior is wrong. I can't. It just grates on me when language is racist, xenophobic, anti-woman, anti-gay, etc. I don't enjoy books that are like this. It ruins them for me. I still remember reading a book when I was 15 by James Farrell that had racist words in it. Shocked me then. Now I'm not shocked but perturbed. If people are going to be offended by the book, then I won't read it either. If a woman writer is describing a male character who is sexist, then I'll read the book as I know she is describing a type, but I trust the writer in this case. Don't trust all writers on these matters, so I avoid what is offensive to me. Yep. Why ruin a reading experience? There's too much to read out there, just move on.